I saw this beautiful card on Pinterest and decided I had to CASE it. 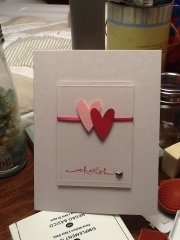 This is my version using pearlized white card stock, rose red and pretty in pink card stock from Stampin' Up, rose red ink, some skinny ribbon gifted from a friend, and a heart brad. I embossed a simple square frame and attached all of the pieces.